So while there is plenty of time left in the school year, we are on the downside so that means lots of fun stuff for us to do at school, e.g., field trip, field day, and the Boosterthon Fun Run. The Boosterthon Fun Run is something I look forward to because I’m not all that great at basketball and and soccer like my other friends so I usually don’t play those with them or at least not when there are a lot of kids playing. But I know I can run. I may not be the fastest, but I can get my Forrest Gump on and run for days. The Boosterthon Fun Run is where I get people to pledge a certain amount based on how many laps I run around a 1/16 of a mile track. Don’t worry, I won’t lose my college sports eligibility for taking money for sports performance. No, the school uses this money to invest in our educational tools. This year, it was for technology which is going toward more iPads for the school because (queue the violin) do you know how challenging it is to learn by only using textbooks and workbooks that are….printed?? The other schools in the district tease us and tell us when we think of a good comeback to send them a letter because we can’t access our email at school….sniff, sniff….oh the humanity…..#1stWorldProblems….forget Jerry’s Kids or Sally Struthers (dated references?? ), host a telethon for our suburban, predominantly upper middle class school. In all seriousness, the goal is a great one – it is to help better our ability to work with technology in a world that continues to make technological jumps at the speed of light and prepares us to be contributors instead of spectators. 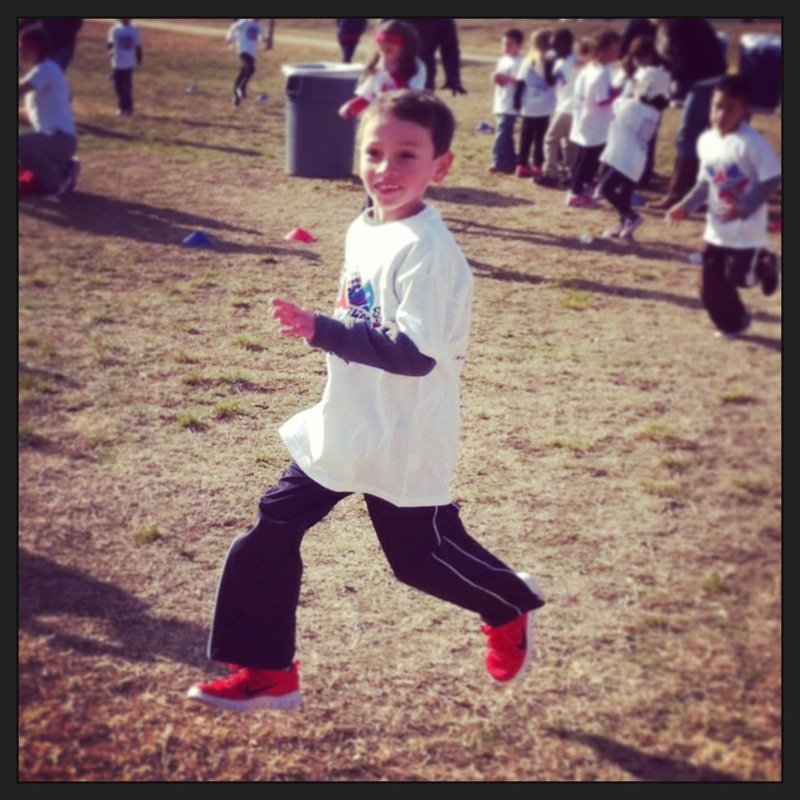 Last year, as a kindergartener, I ran 44 laps which works out to be 2-3/4 miles. So since I’m a 1st grader now, there was no way I could do less than last year. My goal is always to do better than what I have done before – it may not always be the best in the world, but it gets me closer to my best every time. Besides, my fan club doubled in size since last year so there was no way I could put in a sub-kindergarten effort. This year, my grannie and aunt were there to cheer me on in addition to mommy and daddy. So how did I do? 46 laps baby! That’s 2-7/8 miles. Mommy and daddy said I did awesome and since I enjoy running so much, they want to start running with me regularly to train for a race. Bring it because to paraphrase The Boss – baby I was born to run (again with the dated reference, huh?? ).